How many of you have used your favourite Internet application recently - and received a convenience login suggestion? To continue, please tell us who you are! 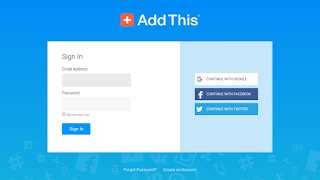 Login with your FaceBook, Google, or Twitter account. Many small business Internet services, instead of making you setup one more unknown account, are letting you login, and use their product, based on your FaceBook, Google, or Twitter account. This is not a magical concept. It requires a lot of work, to make this happen. The major Internet services, such as FaceBook, Google, and Twitter, act as identification sources for many smaller services. Letting FaceBook, Google, and Twitter identify us is good, for everybody. With FaceBook, Google, and Twitter providing identification services, we see a win - win - win situation. FaceBook, Google, and Twitter get to set the standards for identification - and make the Internet safer for everybody. The lesser known services can concentrate on their product - and not worry about identification. The users of the lesser known services have one less account / password to maintain. I login to AddThis, using my Google account. That's one less account, for me to maintain. This is called Open Protocol Authorisation - or OAuth. I use OAuth to login to AddThis - and to other services, at various times. Followers used to use OpenID Authentication - and complicated code. For many years, Blogger used a similar concept - OpenID authentication - with the Followers gadget. 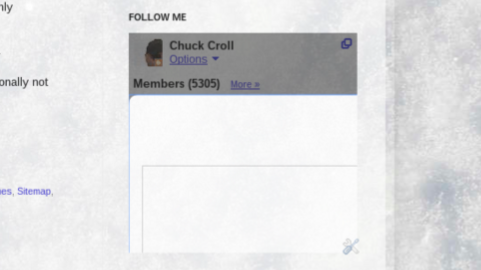 People could Follow our blogs, using a Twitter, Yahoo, AIM, Netlog, or OpenID account - and they could identify their activities (similar to our Blogger / Google+ profiles) using a profile hosted by Orkut, Netlog, Plaxo, or Twitter. This use of a third party service, for account and / or profile hosting, is not magical. OAuth / OpenID standards or not, each different service has its own peculiarities. Coding, to allow for these peculiarities, makes the Followers gadget more complicated than it should be. Complicated code is not good. Blogger has to maintain duplicated code to allow for different browsers, operating systems, world wide government bureaucrats, and more. More time spent fixing problems == less time spent improving features. Followers has shown problems to different people, at various times. The Followers gadget, for many years, has well known problems. This gadget is configured incorrectly." Everyone who uses Followers, on their blogs, has surely seen this notice. 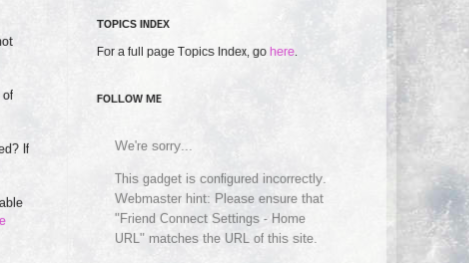 The gadget, on this blog, has shown that error, more than once. Many would be Followers have told me so. Many of us have tried to surf the Followers gadget, on their favourite blog, and seen this display too. A lot of people saw the latter, in 2015, when using the gadget on this blog. Now, Blogger is simplifying Following - and dropping some Followers. This year, Blogger Engineers are removing excess code in the Followers gadget, to make it more reliable. This requires removal of code which supports OpenID accounts in Twitter, Yahoo, AIM, and Netlog - and profiles hosted in Orkut, Netlog, Plaxo, and Twitter. Now, Following supports only Blogger / Google / Google+ accounts and profiles. Note that Blogger / Google / Google+ accounts do not have to be GMail. Removal of the excess code requires removal of the OpenID accounts and profiles. And, we have been seeing our Followers counts drop, since mid December 2015. It's important to note that anybody "Following" our blogs, using OpenID, can continue to use any email or third party newsfeed subscription - neither of which are affected by the account / profile cleanup. They were not using Reading List to read our blogs, since Reading List requires a Blogger account. And with the Followers gadget broken, no new readers were surfing to our blogs. I don't like the drop in numbers, any more than the next blog owner. But I also don't like being unable to surf, using the Followers gadget. So, I'll endure what looks like a 20% drop in Followers count - and be able to use the Followers gadget. And hope that having a working gadget, with less Followers, will still lead to more traffic - more so than having a broken gadget with more Followers. And, move forward. And, my deepest apologies to those of you who were Following - but are not now - and wanted to find out why you were dropped. Just use a Blogger / Google account, and Follow again, using a working Followers gadget, or using the Reading List wizard, please. And we'll put this sad story behind us. Thanks for the update, and the question. Your Followers gadget is setup fine. The header is a perfectly good place for the gadget. Tell Eloise to chill. You'll be back to 250 sooner, if you work on the blog, not show 10 year old kidz having a temper tantrum - in multi colour yet. Put a notice on your blog, with the first sentence carefully formatted. Do you see mine (after I reworded it)? If you did not use a Blogger / Google account when you Followed this blog, years ago, you are probably not Following now ..."
That's a "Featured Posts" gadget, positioned in the posts column, at the top of the column.